The RFEF's Appeals Committee has turned down Atletico Madrid's appeal and upheld Diego Costa's eight-game ban. 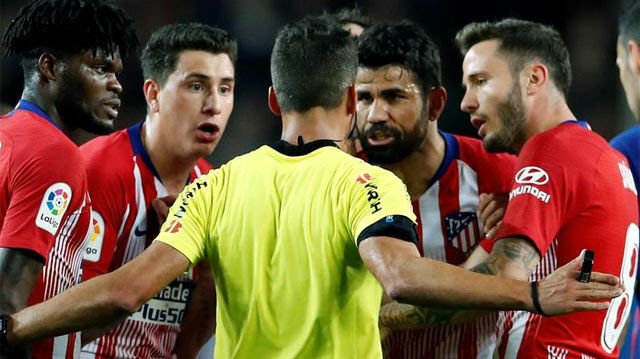 Costa was sent off in last weekend's 2-0 loss to Barcelona, whic heffectively ended Atleti's title hopes, for insulting the referee and grabbing his arm. On Thursday, the RFEF hit him with an eight match suspension: four games for the insult and four for the grab. Atletico appeal the decision but the Appeals Committee have rejected that appeal and, pending the Rojiblanco taking things further, Costa will miss the rest of the season. The club have 15 days to take their appeal to Spain's Administrative Court of Sport. There are seven league games left in the current campaign.